Andi B. Goode: My latest finds. So, today Mum and I went to a church op-shop and I actually found a few nice things - I haven't had a lot of luck in op-shops of late, but hopefully today broke the unlucky streak. 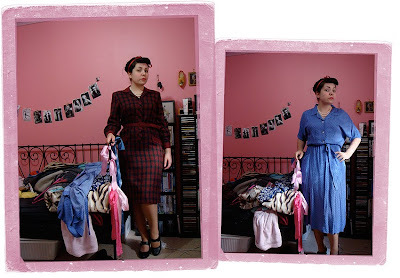 Left: 1980s plaid dress that looks very 1940s. I'm rather in love with it, actually. Right: handmade dress, not sure of era. I think it's a little too baggy for me around the top but Mum thinks it looks OK. What do you all think? Also, please excuse my untidy room and lifeless expression - I was rather a bit tired after a day of shopping and, well, the untidiness is due to the fact that I'm really quite lazy! I also bought a very cute 1960s Terylene brunch coat, which still had its original swing tag. And this book, published in 1957, which I think shall be rather an amusing read! The plaid suit is such a fantastic find! I love it! And I think the dress looks lovley, but if it really bothers you you may as well alter it so you will get more wear out of it. The blue dress looks about 1950 - big pockets were the in thing around that date. I love the 1980s suit and that book looks hilarious! ohh i love the plaid dress, it looks gorgeous! Love the plaid dress too!!! The blue dress would be great for just knocking about the house... it looks like it was meant to be a gardening/housework dress. That book looks hilarious! I'm sure it has some suitably cringeworthy nuggets of wisdom contained within. Frances: Thanks. =D That's a good point - I think I'll try it on again and see how I feel. Miss Rayne: Yeah, it definitely has a 50s feel to it. Oranges and Apples: Thanks. Haha, yes, I can't wait to read it! Angel: Thank-you! Yeah, that's a good point - it'd be great for that. Louise: Doesn't it? It's going to be a fun read. Any time I think something is too big, my mom also tells me that it looks fine. But I agree with your mom, it does look good! That book looks hysterical. And what is a brunch coat? I'll have to look it up. Looks like you made a fabulous haul! The suit looks great on you!!! Fun finds, you'll have to let us know how that book is (and maybe scan some of the illustrations inside!). Both outfits are adorable, maybe you could have some darts or pintucks put into the bust of the dress? It should be a fairly simple alteration. 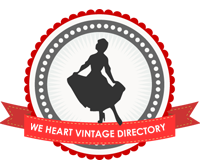 Fantastic finds, that plaid dress is amazing! I would have swooped down on that in a heartbeat, too! Congrats on you wonderful scores, sweetie! Isn't it awesome to go and actually find stuff that makes you smile? Leilani: Thanks. =] I shall definitely be scanning the book some time. I might just try that with the dress!